Every property has a story and the numbers alone tell only part of the tale. See our impact through the lens of the individuals and organizations we have worked with. From 2012-2017, the Landbank made significant progress in revitalizing distressed neighborhoods. The Port recently completed a Six Year Impact Report outlining the contributions made since 2012 to Cincinnati and Hamilton County through the work of The Port and its managed entities such as the Landbank. We’ve included some highlights below, but you can read the full report here. "In my 31 years with the City, we have never found a better partner in code enforcement than the HCLRC (Landbank). Between the work of the Landbank and our own work, we have seen a 20% reduction in the number of vacated problem and condemned buildings." 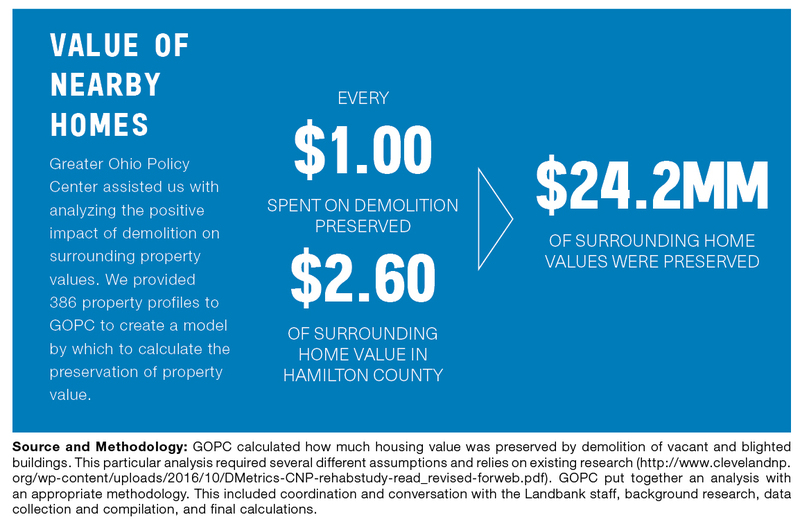 From 2012-2017, the Hamilton County Landbank spent more than $17 million allocated to Hamilton County from two state demolition grant and reimbursement programs. The Landbank and grant sub-recipients demolished 976 structures. By the close of 2017, the Landbank held 764 properties in its inventory. While we work to find responsible end users for every property, we clean up lots, cut grass, secure structures and take other necessary measures to maintain properties under our ownership. From 2012-2017, we spent $1,014,056 on lawncare and maintenance on our properties. The Landbank’s success relies upon Hamilton County jurisdictions, neighborhood partners, and residents with a vision to renovate or repurpose real estate. We work to find end users and entities for properties to put them back to productive use. From 2012-2017, 329 formerly vacant, blighted properties were sold to new end users. "Ownership is everything when it comes to having a beautiful neighborhood, and helping the owner occupiers control more of the land around them is the best way to start the revitalization process." Through the REACH (Rehab Across Cincinnati and Hamilton County) program and the work of the Homesteading and Urban Redevelopment Corporation (HURC), 45 single-family homes have been rehabbed or built. The Landbank’s Historic Structure Stabilization Program preserves landmark structures throughout Cincinnati and Hamilton County for reuse and redevelopment. Through 2017, 15 structures have been stabilized utilizing $2.3MM in funding, including $887k in funding from the City of Cincinnati.